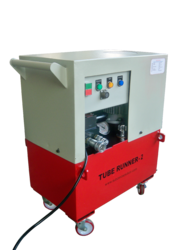 We are offering Tube /Stub Pulling System for removal of stubs during re-tubing. 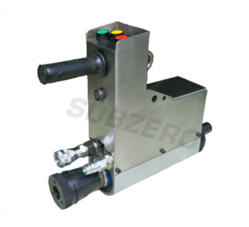 Max Diameter through Gun Up to 4"
Subzero is a hydraulically driven unit which Offers automatic Hydraulic Tube Pulling Gun from Condenser /heat Exchanger. Available with a choice of electric system or pneumatic system for hazardous explosive Working environments. Backed by our highly skilled and experienced professionals we are offering our clients a wide assortment of Tube Pulling Gun. 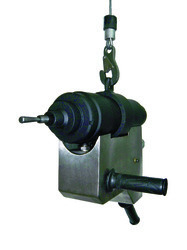 This pulling gun is developed by using superb quality material and latest techniques. Offered pulling gun is suitable for various tube capacities& highly praised by our patrons owing to its durability & performance. Furthermore, we test this pulling gun against diverse quality parameters so as to make certain its flawlessness. 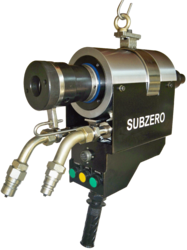 The Auto-Xtractor series Tube Pulling Machine is designed for rapid extraction of stubs from the tube sheet. This tool work in combination with Tube Runner-2 power pack. Each stub removal operation is completed in less than 30 sec. Best suited for small maintenance work. 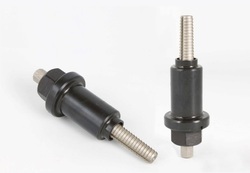 Can be used with impact wrench in combination with drive socket. Looking for Stub Pulling System ?